Iceland isn’t exactly known as a beach destination. After all, why would you get excited about beaches in a country where the temperature rarely pushes over 20 degrees? Well here are nine incredible Iceland beaches that might just change your mind. Colorful sands ranging from black, red and gold. Breathtaking views of crystal seas and epic mountain ranges. The beaches in Iceland might look like they’re from another planet but I’m telling you, they’re real. Exploring the beaches in Iceland is an absolute must for your time in the country. Few destinations boast such a variety of rugged landscapes and spectacular views as Iceland – something that extends to its coastline. Iceland can be costly to visit – but its natural attractions are not. 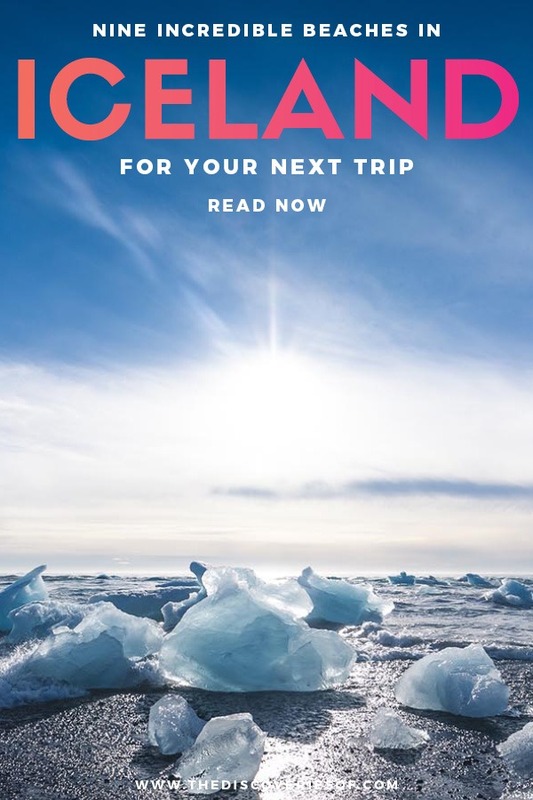 Wondering where to start during your time in Iceland? Several travel bloggers have chosen their favourite beaches in Iceland. Inspiration guaranteed. What Makes a Black Sand Beach Black? When I traveled to Iceland, I knew that in addition to the regular Iceland spots like visiting Thingvellir and Reykjavik, I needed to see Vik beach. Besides being a gorgeous black sand beach in Iceland, there are some special features about the place that make it a unique experience, even in a country as unique as Iceland! For one, if you sit on the beach and look south, there’s no land between you and Antarctica. That’s a really heavy, significant thing to ponder when you’re on the edge of a tiny island far in the north Atlantic. The beach, which has become very popular in the last few years, is also near the gorgeous Reynisdrangar basalt stacks (reminiscent of Northern Ireland’s Giant’s Causeway). While I was there, we had a picnic with a local sheep dog who came to visit us. To get there, we rented a car in Reykjavik for the day. This was a great way to get out of the city and explore the south coast. Vik Beach Iceland is located near the town of Vik i Myrdal, thus most tourist refer to it as Vik beach, but locals refer to it as Reynisfjara Beach. Once you’re finished in Vik, keep going and explore the area, as the entire south coast is gorgeous! 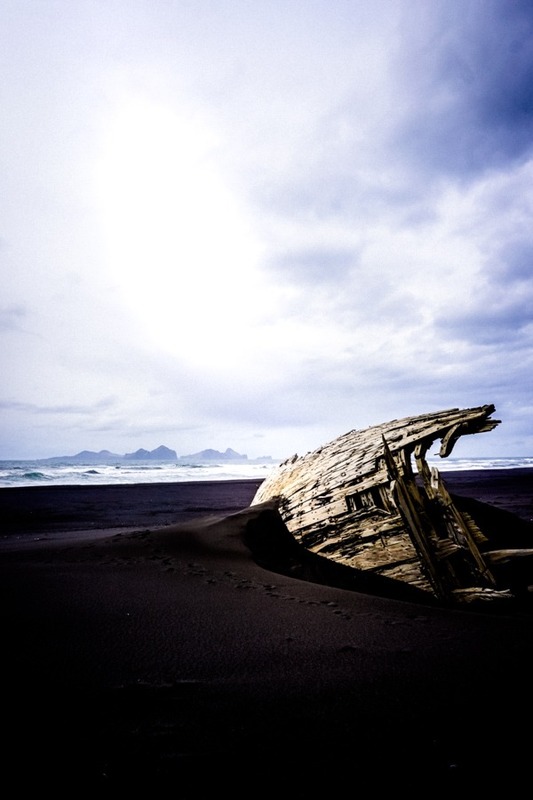 From Reykjavik to Vik black sand beach, it’ll take you about 2 h 30 mins (179 km) by car. On the way, you’ll pass some stunning sights, including, Skogafoss Waterfall, Seljalandsfoss Waterfall and Dyrholaey. Iceland’s diamond beach is one of the most awesome beaches in the country because of how unique it is! Located on the banks of Jökulsárlón Glacier Lagoon, this beach is studded with crystal clear chunks of ice that have broken off from the nearby glacier. The beach near the glacial lagoon is commonly referred to as Diamond Beach and is located on the southeastern coast of Iceland. The diamond beach is located just off Iceland’s ring road. If you want to visit the beach that stretches along the ocean, it is on your right side, going north on the Ring Road. On your left side is the diamond beach that runs along Jökulsárlón Lagoon. For wonderful sunset views, go right, for stunning views of the beach and ice, go left! Either way, the Diamond Beach at Jökulsárlón Lagoon is one of the most beautiful beaches in Iceland. From Reykjavik, the drive is 4 h 46 mins (372 km) via Þjóðvegur- the Icelandic Ring Road. Brutally beautiful. These are the words I love to use when describing Iceland as I don’t think any other words really describe it. Iceland is an absolutely stunner. Literally every corner of it boasts a beautiful view, a gorgeous waterfall, or a dramatic scene. But its terrain, weather and shores are also totally savage. Londrangar Cliffs and Beach are no different. I’m assuming you didn’t think you’d go to Iceland to have a warm and sunny beach to enjoy (and if you did, sorry to burst your bubble) but the beaches will still be some of the best things you see in Iceland. I loved Londrangar Cliffs because nobody else goes here. 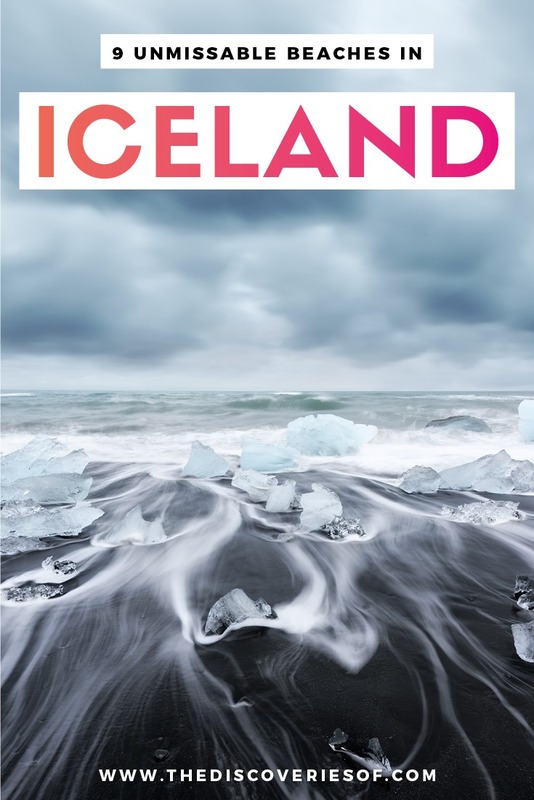 This area isn’t as frequented, especially when you know how many people actually go to Iceland each year! I always include it as one of my Iceland planning tips. These secluded cliffs and hidden beaches are the epitome of Iceland’s brutally beautiful coastline and I think the picture does the rest of the talking. Come here, stand on the cliffs, and get mesmerized by the pounding waves, tumbling black rocks, and epic rock formations. By car, this journey will take 2 h 31 mins (192 km) from Reykjavik via Snæfellsnesvegur. As a heads up, this route has tolls. “We’re going to go on an adventure,” Addi from Midgard Adventure said as we hauled ourselves up into the superjeep. 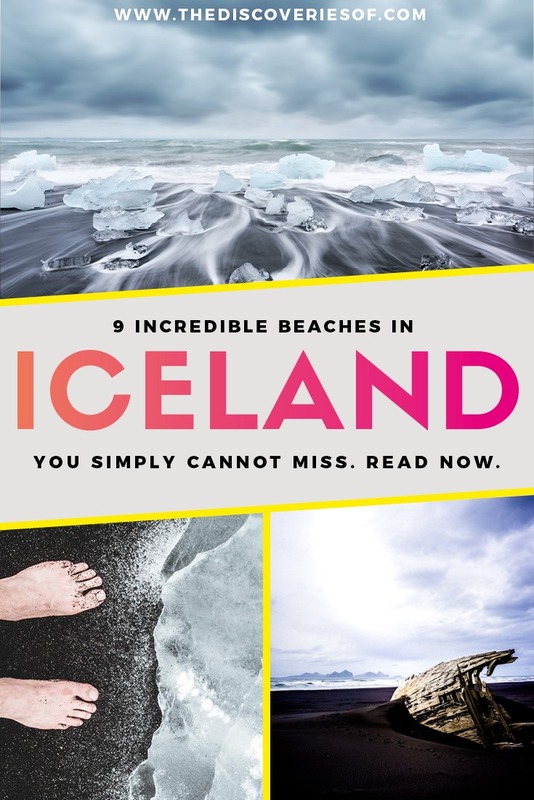 “It’s a secret Iceland beach that no one really visits.” Sound too good to be true? It wasn’t. Fifteen minutes of off-road driving over dunes and through streams, the landscape of Landeyjahöfn spread out before us. 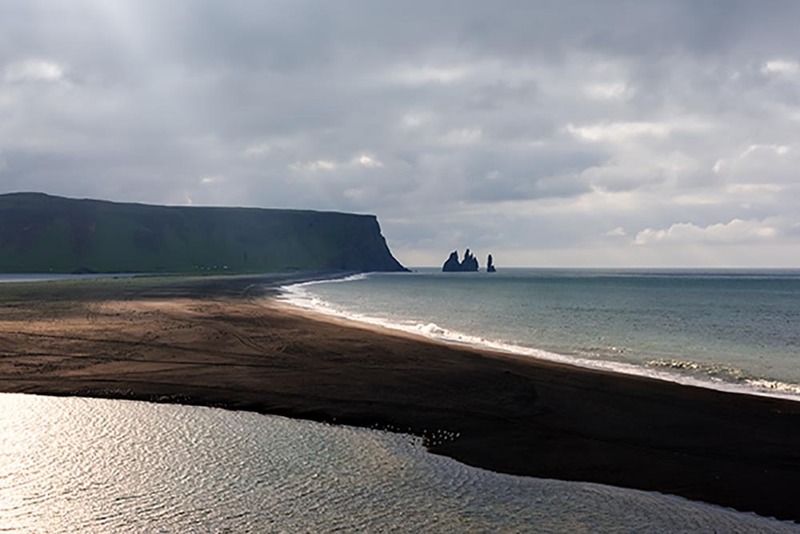 A black beach in Iceland without another soul on it. It’s one of Iceland’s true hidden gems. Miles of coastline pounded by the wild Atlantic surf stretched into the distance. 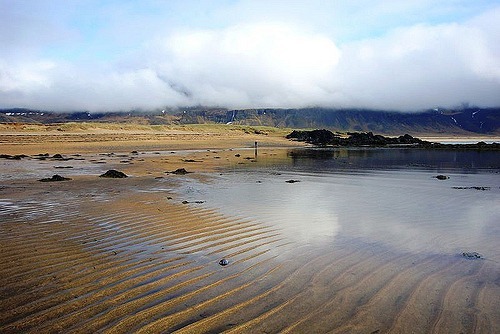 One of the quieter Iceland beaches, Landeyjahöfn is no less dramatic than some of its more famous counterparts. Facing the Vestmannaeyjar islands on Iceland’s south coast, it’s a great place to go bird spotting. If you’re lucky (we were), you can even see seals splashing about in the water just off the shore. From Reykjavik, it is a 1 h 40 min (130km) drive via Þjóðvegur (the Iceland Ring Road) 1 and Route 1. You’ll need a 4 x 4 to access some parts of the beach, or you can drive to the pier at Landeyjahofn and walk from there. 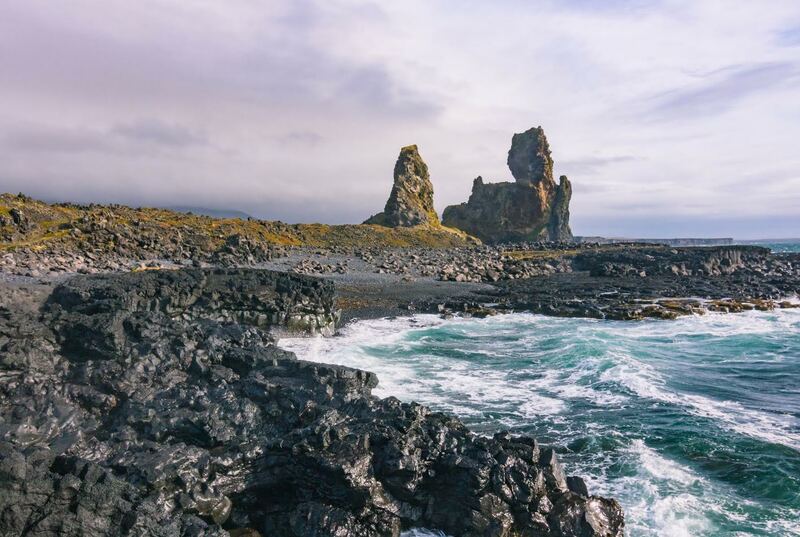 Djúpalónssandur, also known as The Black Lava Pearl Beach, boasts pretty much all the drama that nature can offer. Lava fields with beautiful large rock formations protrude from the ground; there is an almost otherworldly feel to this one of a kind beach. If you head along the Nautastígur path, you’ll come across two stunning lagoons called Djúpulón or Deep Lagoons and Svörtulón or, Black Lagoon. Both of these gorgeous lagoons have said to be blessed by Bishop Guðmundur góði and hold special healing powers. Take a look at the remnants of the ship The Epine GY7. The iron pieces are kept intact and are not allowed to be touched, to commemorate the English fisherman who lost their lives in the wreck. Even more striking than the lava you’ll find Pearls of Djúpalón, small black pebbles or lava pearls that make up the beaches surface and are also responsible for its name! Driving from Reykjavik, you’re looking at a 2 h 29 min (200 km) journey via Snæfellsnesvegur. This route is tolled! Rauðasandur is one of the most breathtaking beaches in Iceland. With the red tinge of the sand contrasting with the black cliffs, it looks like something straight out of Mars. To add to the beauty, the sand sometimes changes colour from it famous red hues to yellow. 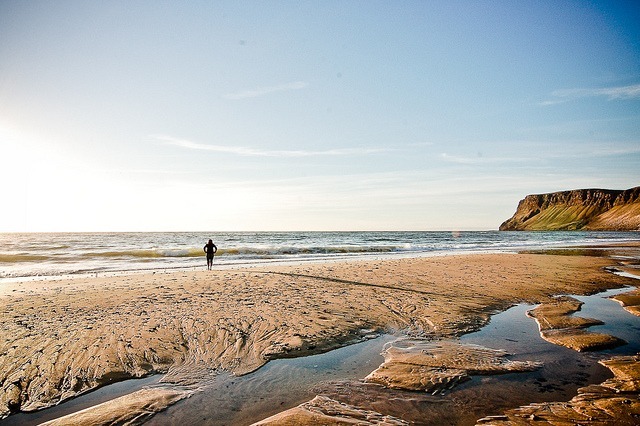 This tranquil beach is the ideal destination for a calming beach walk. With its vast open landscape and its natural canvas of warm colours, Raudasandur Beach is the perfect spot for a quiet moment. Unlike the numerous black sand Iceland beaches, Breidavik beach has golden sand – something rare enough to deserve a visit in itself. It’s a gorgeous spot: a lovely little church and miles and miles of golden sand. On a sunny day, you could almost kid yourself that you’re in a tropical location thanks to the gorgeous golden sand and blue sea. If you’re are a fan of bird watching, Breidavik should most certainly go on your Iceland beach bucket list. You can see a plethora of seabirds and might perhaps even catch a glimpse of a puffin. In the distance, you can spot the gorgeous mountains that are topped with the golden sand that has blown over from the beaches surface. Once you’re bored of soaking up the view, Breidavik is also a good spot for hiking, trout fishing and exploring historical sites. Frock Reykjavik, the drive is 5 h 22 mins via Vestfjarðavegur and this route is tolled. 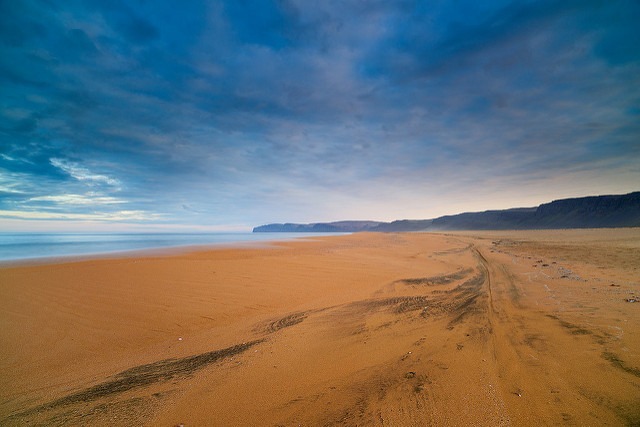 Búðir is another one of Iceland’s rare golden sandy beaches. It was formerly a fishing village but was abandoned in the early nineteenth century. All that remains is a hotel and a beautiful yet gothic small, black church. Chances are that if you rock up here, you’re going to get it to yourself. Sometimes, on a good day, you might end up sharing it with a few playful seals too. Búðir is surrounded by mystery. Local legend has it that the area around the path from the beach to the nearby lava field is scattered with elves – so watch where you step! It’s a short 12 min (9.6km) drive from Reykjavik via Route 41. Hands up if you love seals! Me too. 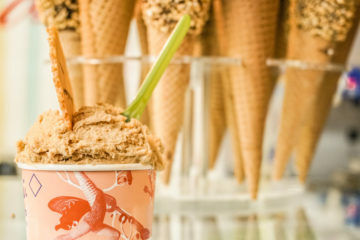 You’ve got to head to Ytri-Tunga, otherwise known as Iceland’s seal beach. The clue is in the name – between June and August, the beach is dotted with seals basking in the (not so hot) Icelandic sun. Turns out we’re not the only ones who love to sunbathe. From Reykjavik, it’s a 2h (152 km) drive via Þjóðvegur and Snæfellsnesvegur. Expect tolls on the way. It’s sometimes best to opt for car hire, especially to get to those beaches in the more rural areas. 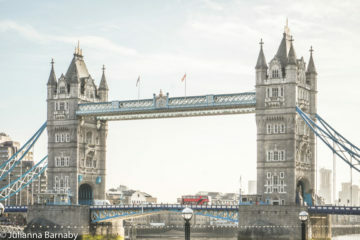 You can find loads of local car hire companies – head to Holiday Autos. Whilst Iceland beaches may appear quaint and beautiful, the water can be anything but. Be warned of dangerous waves, specifically ‘sneaker waves’. These waves are true to the name; whilst the water may appear tranquil, a large, powerful wave may sneak up on you, pulling you under. It may sound like I’m being dramatic, but people die every year in Iceland’s waters, so be very careful near the sea. 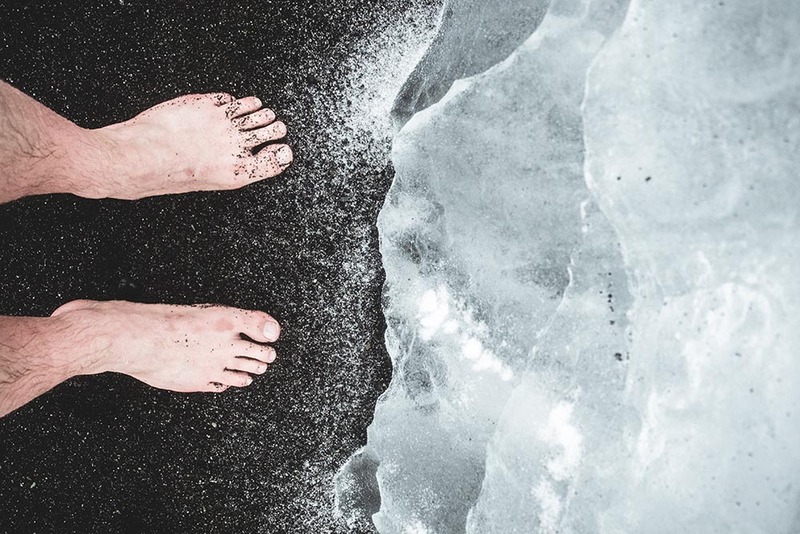 The black sand is part of the main appeal of some of Iceland’s beaches. But what gives it this striking appearance? Well the reason the black sand beaches of Iceland have their stunning colour boils down to the island’s volcanic surroundings. The remnants of volcanic rocks and ash, worn down to fine grains over hundreds and thousands of years gives the black sand beaches their stunning, charred tone. Great post! I’m planning on visiting Iceland soon although I don’t know when! I’ll have to check out some of these beaches! Totally do – it’s brilliant. Hope you make it there soon. A real pleasure – the beaches deserve to be done justice! Iceland is such a popular destination right now and I can totally see why! 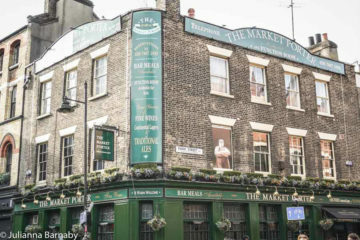 I hope to go soon! great guide! All of these look so incredible! When I finally get to Iceland, I feel like I’ll need a month with all the places I want to go. 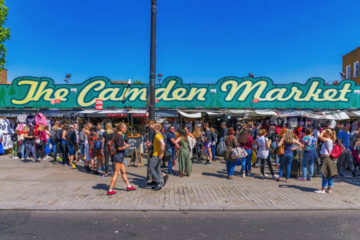 It’s totally true – there’s so much to see. The more I spoke to locals, the more I found out about and reckon you could spend an age going to new places in Iceland and never get bored. Wow! 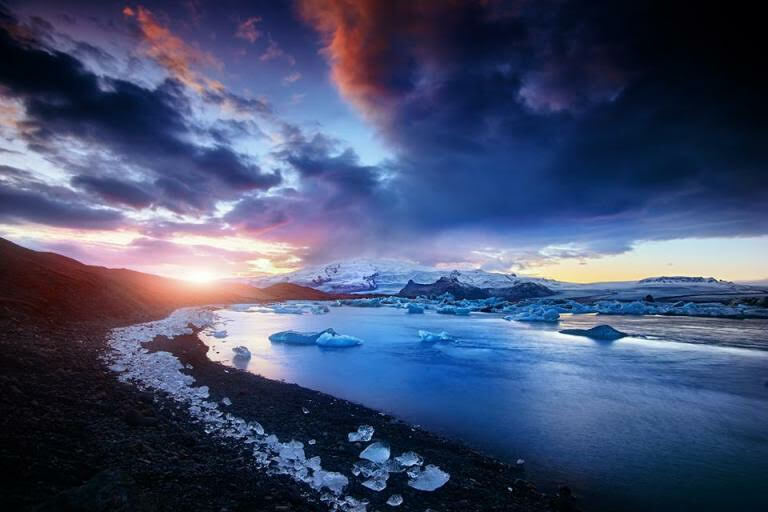 The magical dreamland that is Iceland <3 I have never seen a black sand beach before…I'd love to visit one. Thanks for this gloriously beautiful post.